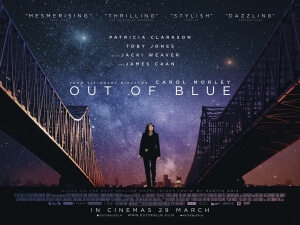 When I first saw (and reviewed) Carol Morley’s Out of Blue back in November, I remember thinking that it was such a surreal and completely unconventional movie that I was more worried about what a more mainstream audience might think of it than what I actually thought of the movie. I also remember pointing out certain things about it, like how it felt like a very Lynchian dive into oddity with some of its performances and dialogue, and overall felt that it was probably best suited for niche audiences more than the mainstream. Having now seen it a second time, though, I do have to admit that my overall opinion on the film has not only improved, but I now also have a newfound respect for it, in ways that even I couldn’t have predicted back in November. The film, as a reminder about the plot, is very loosely based on the Martin Amis book Night Train; it sees New Orleans homicide detective Mike Hoolihan (Patricia Clarkson) investigating the apparent murder of Jennifer Rockwell (Mamie Gummer), a renowned astrophysicist and black hole expert, and the only daughter of respected war veteran Colonel Tom Rockwell (James Caan). As Hoolihan goes around trying to piece together the clues, including talking to several of Jennifer’s known associates such as her supervisor Dr. Ian Strammi (Toby Jones) – a name which is, funnily enough, an anagram of Martin Amis – and her boyfriend Duncan (Jonathan Majors), she realises that the murder bears similar trademarks to the historical .38 Caliber Killer, which is a fact that begins affecting her deeply and causes her to continuously challenge everything she knows, from her forgotten childhood to her previous alcoholism to even her own place in the universe. I should say, before I get into what it is I found immensely fascinating about this movie, that it is not a perfect film; the movie has a slow-burn pace to its central mystery, with red herrings and procedural clichés galore, which can become a little straining when you want the film to simply get to the point, and it can at times be somewhat complex to fully understand, with a conclusion that doesn’t so much tie up loose ends but rather leaves you asking more questions than you started out with. It is, by most accounts, a movie that is flawed, and it’s easy to see why it’s not going down as well with other critics (it currently rests at 40% on Rotten Tomatoes). And yet, the film offers a truly unique and unconventional outlook on everything that, if nothing else, should be admired for its sheer ambition and endless array of ideas. Carol Morley is a filmmaker who has made some fascinating movies in the past such as The Falling, Dreams of a Life and her very personal documentary The Alcohol Years, all of which seem oddball and far too surreal on first viewing, only for them to improve somewhat on multiple viewings; Out of Blue is no different, except for the fact that this is easily her most ambitious project to date, as it not only takes the source material and pretty much just does its own thing with it – similar to how Stanley Kubrick took Stephen King’s The Shining and made, well, The Shining – but it asks the audience several questions about the nature of stars, where we as a species fit into this enormous universe, and even philosophical queries into the classic Schrödinger’s cat argument. Even though not all of her ideas pan out in the way she perhaps had hoped, it’s impossible not to feel fascinated by Morley’s sheer ambition in throwing as much as she can to the wall to see what sticks, and luckily the ones that do end up sticking are all heavily intriguing and interesting enough to hold your focus and undivided attention. Looking back on my earlier review, I now realise that my comparisons to David Lynch movies were way too easy, and also not entirely accurate; while there are some surreal moments throughout the film, its overall look and feel is much more like a movie such as Chinatown or Donnie Darko, or even the vast majority of the late director Nicolas Roeg’s filmography (as an interesting side-note, Roeg’s son Luc Roeg serves as a producer on this movie, as he had done on Morley’s previous film The Falling). Even in the film’s more out-there sequences, it remains grounded enough to just about stick to its film noir roots, something that the vast cinematography and especially Patricia Clarkson’s stupendously composed and quietly compelling lead performance also help enormously to ensure it doesn’t get too far off the ground. You’re following this mystery with a sense of curiosity about where it’s all eventually going to lead – even if the conclusion doesn’t entirely leave you satisfied – and are hooked by its grounded philosophies and its ambitious, life-pondering questions about life, the universe, and everything. It’s a film that I have a tremendous amount of newfound respect for, even though I do admit there are flaws that are hard to ignore, and I would say that if you see this movie and don’t think that much about it, I would recommend a second viewing at the very least to see what Morley is aiming for here; that way, you can at least appreciate the sheer ambition that she has put into her most out-there movie yet, in a very good and promising way. Out of Blue is a movie best experienced in multiple viewings, as there is a tremendous amount of respect for writer-director Carol Morley’s heavily ambitious vision, even if some of its ideas don’t always pan out as well as they could have been, but it’s a solid and intriguing enough mystery to leave you hooked all the same.